The Scream Tour has been around, but this time the artists on the bill cater to a different type of audience. Ciara is the first female headliner and T.I. has a large male as well as female fan base. Lloyd, Yung Joc and T-Pain opened and did not disappoint. 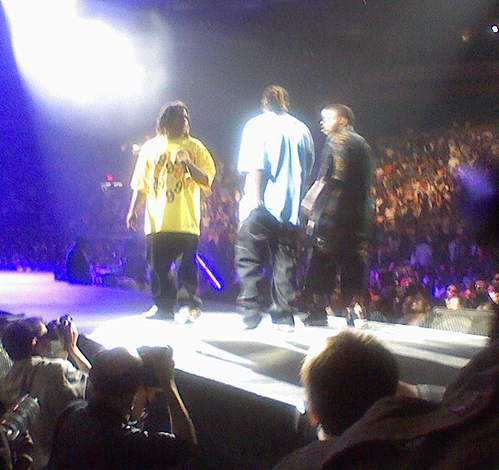 Diddy came out on Yung Joc's set and had the crowd goin' crazy. T-Pain sang all his hits and songs he was featured on and Lloyd brought his MJ-esque moves for the ladies. Ciara and TI, however, put on the best show. Her single was cool but it was her smooth dance moves that had everyone going crazy. T.I. had command of the stage from the time he entered til he left. The ladies lost their minds and he made sure he showed some skin when had them losing it even more. The revamped Scream Tour served the same purpoe as all the others. I left with a headache from all the screaming but it was a good show indeed. OMG GYRL U WENT TO WHAT THEY CALLIN A MOMENT IN HOP OP HISTORY! !...LOLZ...HOW WAS THE PERFORMANCE WITH 50 CENT JAY-Z KANYE AND DIDDY!?! ?...OMG GURL THAT MUST HAVE BEEN SO EXCITING! !...CAN U TEL US ABOUT THAT?? THIS IS A HOT PIC! I WISH I WAS THERE!! Seems like the one in nyc was better then the texas show. Man I would have loved to see that show...looks like the New York show had a lot of extra people showing up.